Rellerindos caramels are a favorite mexican candy. 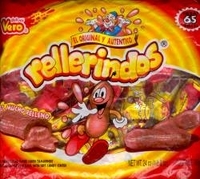 These original rellerindos are a hard caramel with a soft chewy tamarind flavored center. 65 individually wrapped rellerindos caramels per bag. These are a favorite mexican treat and also make great pinata fillers. El Original Y Autentico Rellerindos. Es Mucho Relleno ! Caramelo Con Relleno Suave Sabor Tamarindo.